Assorted Spray Roses are a nice grower's choice of colors. Each stem has a spray of 3 to 5 small roses which open into beautiful blooms. Because of their petite size, Spray Roses are often used for boutonnieres and corsages. FedEx shipping is Free! Proper flower care begins with the timing of your delivery. We recommend you schedule your flowers to arrive 2 to 3 days before the actual event. For a Friday or Saturday wedding your flowers should be delivered on the Wednesday before. Normally they will arrive before 10:30 am, depending on your service area. We strongly discourage Friday deliveries in case there is any kind of a delay with FedEx. 11. Spray Roses are in bunches of 10 stems. Spray roses usually are 16 to 20 inches tall, with multiple blooms per stem. They are indeed a perfect compliment to other flowers for event decorations, bouquets, and in arrangements of wedding flowers. Availability: Spray roses are available year-round from our flower farms. Occasionally we may need to substitute a similar variety for one listed on the website because of availability problems. We will strive to match colors as closely as possible. Packing: Choose boxes of either 80 stems or 160 stems of spray roses carefully packed in bunches of 10 stems. 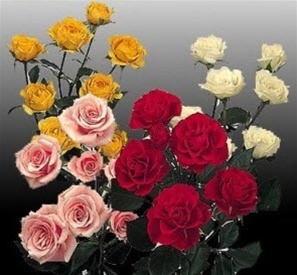 Each bunch of spray roses will consist of the same color/same variety spray rose. Substitution Policy: While we make every effort to provide the exact flower you order, sometimes a substitution may be required to assure your flowers are delivered on time. If so, we are careful to make your order as close to your original choice as possible, even if this means substituting flowers of greater value. While our goal is to always keep you informed, we may ship a substitution without confirmation from you.